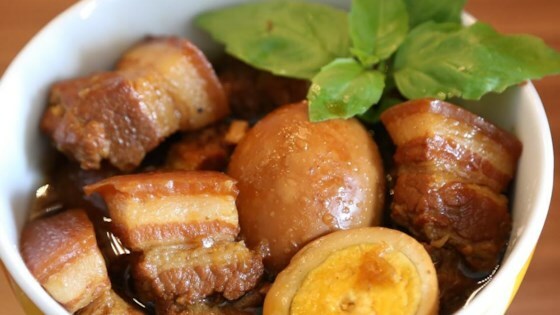 "This dish is very popular in Vietnamese households for everyday eating but is also traditionally served during Tet, the Vietnamese Lunar New Year. The longer you cook the pork belly, the more tender it becomes. If you make this dish ahead, the fat will congeal on the surface, making it easier to remove, and a little healthier! This also allows the flavors to meld a little more. Serve with rice." Slice pork belly into 1-inch pieces layered with skin, fat, and meat. Heat sugar in a large wok or pot over medium heat until it melts and caramelizes into a light brown syrup, about 5 minutes. Add pork and increase heat to high. Cook and stir to render some of the pork fat, 3 to 5 minutes. Stir shallots and garlic into the wok. Add fish sauce and black pepper; stir to evenly coat pork. Pour in coconut water and bring to a boil. Add eggs, reduce heat to low, and simmer, covered, until pork is tender, about 1 hour. Remove wok from the heat and let stand, about 10 minutes. Skim the fat from the surface of the dish. See how to make a sweet-and-spicy, Asian-inspired pork belly dish. Check occasionally while the pork is simmering that the liquid doesn't evaporate too much. Add water a little at a time if sauce seems to be drying out.